Artist Neil Harbisson is completely colour-blind. Here, he explains how a camera attached to his head allows him to hear colour. Until I was 11, I didn't know I could only see in shades of grey. I thought I could see colours but that I was confusing them. When I was diagnosed with achromatopsia [a rare vision disorder], it was a bit of a shock but at least we knew what was wrong. Doctors said it was impossible to cure. When I was 16, I decided to study art. I told my tutor I could only see in black and white, and his first reaction was, "What the hell are you doing here then?" I told him I really wanted to understand what colour was. I was allowed to do the entire art course in greyscale - only using black and white. I did very figurative art, trying to reproduce what I could see so that people could compare how my vision was to what they saw. I also learnt that through history, there have been many people who have related colour to sound. At university I went to a cybernetics lecture by Adam Montandon, a student from Plymouth University, and asked if we could create something so I could see colour. He came up with a simple device, made up of a webcam, a computer and a pair of headphones and created software that would translate any colour in front of me into a sound. If we were all to hear the frequency of red, for example, we would hear a note that is in between F and F sharp. Red is the lowest frequency colour and the highest is violet. I started using it 24 hours a day, carrying it around in a backpack and feeling that the cybernetic device, the eyeborg, and my organism were completely connected. I haven't taken it off my head since 2004, except to change the equipment when it breaks. It looks like an antenna that comes out from my head and goes up to the front of my face. At the back of my head there's a chip which transforms the light waves into sound, and I hear the colours, not through my ears but through my bone. At the beginning I had some strong headaches because of the constant input of sound, but after five weeks my brain adapted to it, and I started to relate music and real sound to colour. I also started dreaming in colour. It has changed the way I perceive art. Now I have created a completely new world where colour and sound are exactly the same thing. I like doing sound portraits - I get close to someone's face, I take down the sound of the hair, the sounds of the skin, eyes and lips, and then I create a specific chord that relates to the face. I'm starting a sound portrait gallery of famous faces which began with Prince Charles, who came to Dartington College of Art, where I was studying in 2005. He asked me, "What's this that you're wearing? ", so I asked him if I could listen to his face, and he sounded very harmonic. Some people might be very beautiful but they might not sound very harmonic, although harmony is subjective. "The first prototype was made in just two weeks. It was held together with tape and cost less than £50. "The entire idea was dreamt up and planned during a 20-minute train ride. I never expected it to change Neil's life. The first version could only see about 16 different colours - now it can see the whole spectrum. "In the future, I believe that many people will use cyborg technology, not just those with a disability. "A similar technology could allow people to see in the dark or experience infrared and ultraviolet light. Just because something is invisible no longer means we can't see it." When people see someone with something electronic sticking out of their head, they automatically laugh or they ask you what you are doing. Sometimes they don't allow me in to places because they think I'm doing something strange. Last year I was attacked by three policemen at a demonstration who thought I was filming them. I told them I was listening to colours, but they thought I was mocking them and tried to pull the camera off my head. There is no end to the evolution of this electronic eye. At the moment, I can see 360 colours and I have extended this to infrared so I can hear colours that human eyes cannot see. I'm currently working on seeing ultraviolet, which is very important because it can damage our skin. But my favourite colour is aubergine. It looks black but it is actually violet or purple, and it sounds very high-pitched. 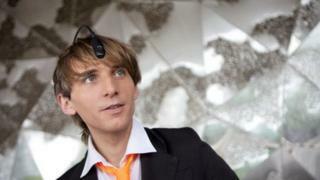 Neil Harbisson spoke to Outlook on the BBC World Service. Listen to the programme here.